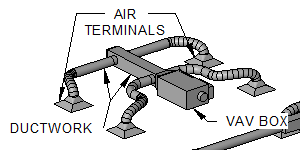 Variable air volume is a type of heating, ventilating, and/or air-conditioning system. Unlike constant air volume systems, which supply a constant airflow at a variable temperature, VAV systems vary the airflow at a constant temperature. The advantages of VAV systems over constant-volume systems include more precise temperature control, reduced compressor wear, lower energy consumption by system fans, less fan noise, and additional passive dehumidification.